My name is Adam Golik and I was born in Cracow, Poland – the city of Polish kings. I have been interested in water, fish, and nature since I was a child. In my 4th grade of primary school, I set up my first aquarium during biology class. As a child, I remember my uncle had his own aquarium and his work fascinated me and I had the utmost respect for him and his hobbiy. Unfortunately, he lived 440 kilometers away from Cracow, in Zielona Góra which made it difficult for me to become immersed in the workings of aquariums. Later, when I went to high school, I became interested in gastronomy and aquariums were not a part of my life. It was not until 19 years passed by that I became engrossed in aquariums once more. 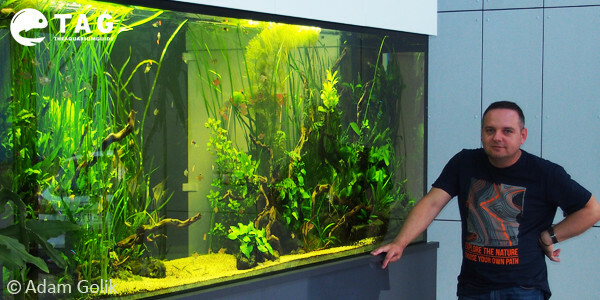 My adventure with aquascaping started in 2009, after my surgery and subsequent loss of my job. I worked as a chef 400 hours per month; without the ability to perfect tastes and visual effects with food, my abilities to create just moved into aquascaping. After being in small kitchen all day, every day, I realized I needed something else in my life. During my recovering from surgery, I started to travel a little to the riversides and mountains in my country and in some foreign countries as well. I knew I had to get back into the art of aquascaping to rebuild the art and visual effects I enjoyed as a chef, but with the calm and peace of an aquarium. The hardest part is starting and researching the type of aquarium you want to keep, the fish and plants you want to add, and the initial cost of all of the equipment. My favorite styles are Iwagumi and Nature Aquariums. Being close to the mountains, fishing for trout and graylings in rivers such as the Dunaj and San, made Nature Aquarium very close to my heart. I take inspiration from every single trip I take. Check out my infographic guide on aquascaping style. I find inspiration in photographing nature; I feel like a part of it just walking by the riverside with my fishing rod or looking for volatile landscapes and situations near the stream. I take all of these landscapes and incorporate them into my aquascapes. What is your favourite species of aquatic plant or fish? My favorite plants are shade-loving ones and mosses. 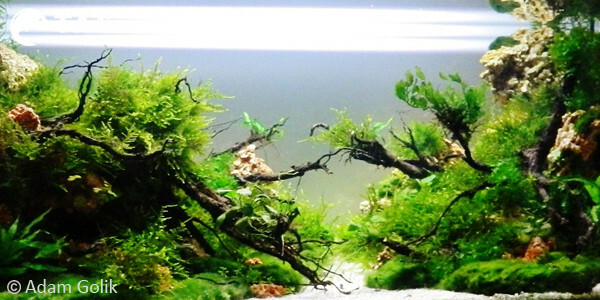 I like dark aqariums with juicy, but dark and expressive shade of green. Some people say it is easier to keep this type; for me it is not about that, but rather personal preference. Microsorium, Anubias Schott, and mosses make unique climates in a tank. When they intertwine with rocks and wood, it creates a wonderful effect. As far as preferred fish, I try to choose fish that live in shoals (Nematobrycon palmeri, Neon, Innesa), but the standard ones that I have to put into the aqarium after a few weeks of setting up are Otocinclus affinis, Crossocheilus siamensis, and Caridina Japonica. 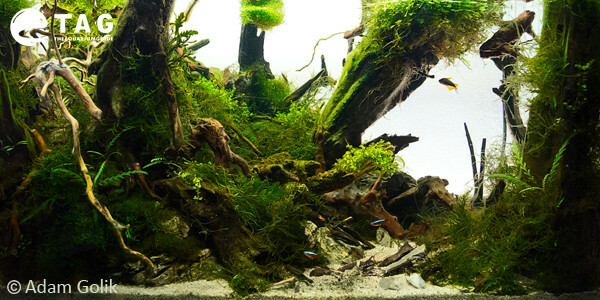 My newest tank is a 90x45x45 size, 10 mm, nature style aquarium. Hardscape for this project was being collected for a few months since I decided to create a tank with what I actully saw. For the technical aspect, I have an EHEIM filter (filtering always double), Co2, lighting mix 4x 39W, skimmer superficial, and glass tube. 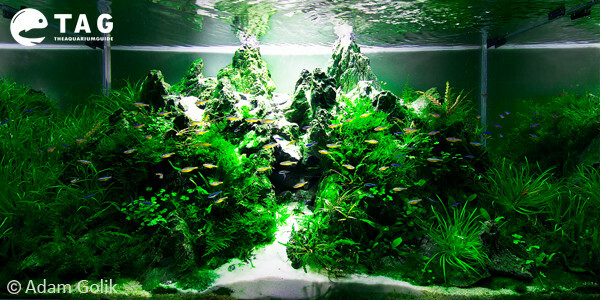 In Poland, aquascaping is based on a few names of famous aqascapers. There are not many of us, but our work is appreciated in the world. I think it will become more and more popular, but it is still developing. Get into the biology of fish and plants – it’s fascinating. Also, make sure your equipment is high-quality and proper for your aquarium. Finally, it is better to set up your first aquarium after you have the knowledge and equipment rather than to hastily begin. Please share with us your website and how can you be contacted? My website is www.akwaria.sklep.pl (It’s in polish) and you can also contact me via my Facebook page – Adam Golik Nano Studio Art. Ahora comprendo mucho más sobre su estilo de montaje de acuarios, la oscuridad es un factor que me ha impactado en todos sus trabajos, creo que es mejor ser acuarista que Chef, aunque las dos mezcladas debe de dar un buen resultado y unos buenos amigos. Felicitaciones. Glad to have interviewed him and thank you for your help in translating it. =) Appreciate the effort.